A vain, attention-seeking bandit who calls herself "The Blue Comet". She is honest, yet unyielding, proud, and selfish. Although she and her brothers donate their spoils to the Unregistered Citizens clustered in the city's underground and outskirts, they often cause large amounts of public damage in the process. She is armed with a laser-based hand pistol, and she rides a large motorcycle with three spherical wheels in front, driving wheels behind, and a cannon hidden in the frame. She occasionally hums the song "Return to love (Jazz version)" to calm herself. 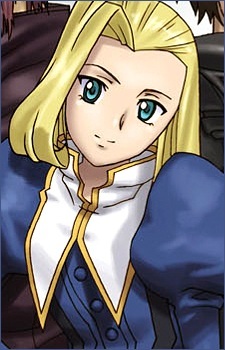 In the later half of the series, she was revealed to be Rita Revant, Roy's daughter who went missing after the Blast Fall incident. She finds it hard to swallow at first but accepts it later at one point. She was supposedly killed in the collapse of a clock tower, but later, she was shown to be alive and working for Ashley Lynx, in order to follow their common dream of equality among residents. The song she often hums was the song she heard of as a baby, when she and Roy's wife (also her mother) were still around before the first Blast Fall incident.